This is exactly where the inspiration for this fun summer crafts idea for a beach theme wreath came from! 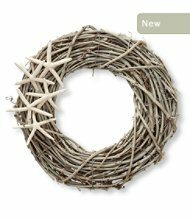 As I was browsing LL Bean’s catalog I saw a whimsical beach themed wreath and I found my way to the craft store. I thought I would show you how to make a beach theme wreath for a fraction of the price of this catalog version. I love LLBean, don’t get me wrong, but I thought this was a little pricey considering the items you can find at the craft store. Here is the LLBEAN wreath! To really get into the spirit of the season, a fun summer crafts project is just what you need. Ever wonder how to make a beach theme wreath? No worries, this isn’t a complicated or labor intensive craft project. In fact, you only need 3-4 things and you are up and going on this super easy DIY summer crafts project. This makes a great gift too for a beach or river house. This summer crafts project is not too complicated yet right? It’s actually a super easy beach theme idea that anyone can throw together at the last minute. I can even imagine this coming together to use for a beach wedding! I decided to first spray my beach themed wreath lightly with the white spray paint for that faded beach look. 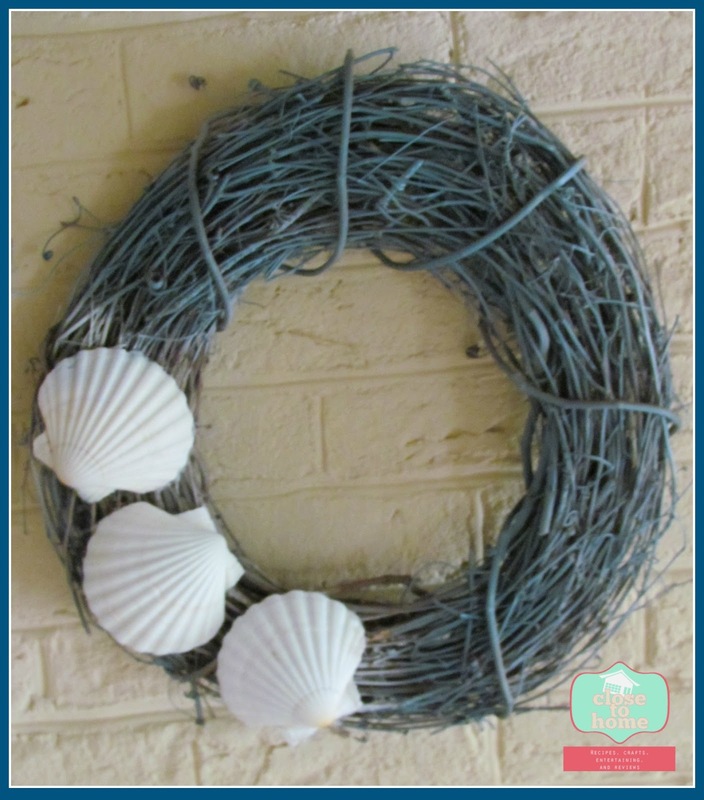 I think a light blue, turquoise, or even peach spray paint would all look great for that summer beach theme you are looking for in this wreath. You can go with any color, but I typically think about the softer beach colors, or bright pops of blue and green from the water when I think of the beach. Once it is dry, just attach your shells or other beach items. Sand dollars, shells, driftwood pieces, or even sea glass can all be glued onto your easy summer crafts beach wreath! I find that odd numbers of items look best grouped on a wreath like this. We used 3 simple shells, but you could even easily glue them on top of each other to create a small cluster of shells in one corner. The possibilities with this are truly endless! As you can see below, I added a bit of blue paint to the wreath for a bit more pop of color. Like mentioned above, you can choose whatever colors suit your preferences. Just have fun with this! When you are thinking about fun summer crafts to make, grab some inexpensive items to make this super cute and versatile beach theme wreath! I know could not be simplier and I guess you could hot glue florist wire and attach to the wreath that way and then take it off for different seasons. Very nice, I’ve always wanted to make my own wreath! Love the simplicity, yet, its beautiful! very cute, I love this! no craft skill needed Heidi, you can do this no problem. Would be amazing if you could shells you found over the summer too. I love, love, love this!!! 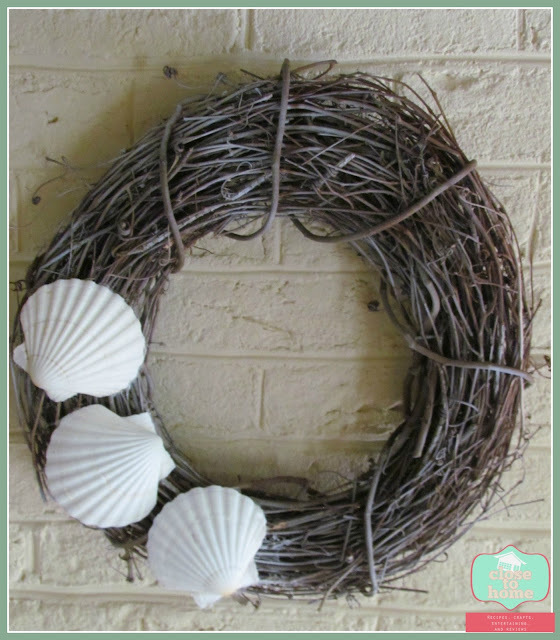 I live in a beach town and have never thought about making a beach theme wreath….it’s now my summer project!! Thanks!! I like yours better, definitely! I like the blue too. It’s very faint but sets off the white shells well. Of the two I like the one with a bit of blue paint on it best. I like them both! And they look so easy to make. I’d probably go with white myself, I as just painted our front door blue. Those are adorable! I’d love to make my bedroom beach themed someday. This is really neat and looks simple to make-I could even do it!! Thanks for sharing! Beautiful!! What a great idea – and you could change it out for any season, as well! !